Siemens is a huge business, with a presence in 200 countries, employing 340,000 people and with revenues totalling UK £72 billion in 2014. In the UK, Siemens plays an active role, both as a significant employer of engineers and also by promoting of the importance of manufacturing, good engineering design and research to the British economy. Siemens has joined forces with the University of Manchester to launch a technology partnership, designed to help students experience the advanced technologies used in the chemicals sector. Siemens supplied the School of Chemical Engineering and Analytical Science (CEAS) with the latest technologies for use by students and local apprentices. Practical experience gained in the new control room at CEAS provides great preparation for a career in manufacturing. It will feature strongly in Manchester’s chemical engineering curriculum. The Siemens PCS7 process control system provides powerful tools, functions and features for cost-effective and efficient operation through all stages of the plant life cycle. I anticipate that this exciting collaboration will enhance regional R&D capacity and further strengthen existing partnerships between industry and academia. 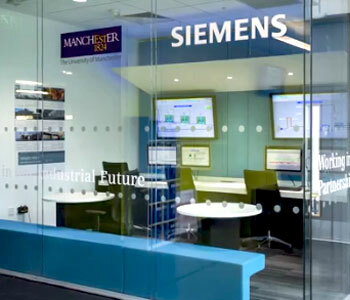 In March 2014, a similar automation suite was opened at Trafford College, also in Manchester, as part of Siemens’ drive to develop skills in North West England and elsewhere. Siemens has already invested in the up-skilling of young people interested in engineering and manufacturing through the sponsorship of a number of universities and colleges across the UK. Today, the company employs 500 apprentices in a scheme that is bigger than their graduate intake. Siemens recently launched its own Junior Factory, a production line managed entirely by a team of apprentices at its world-leading Congleton facility, which makes electrical drives and inverters. Sean McDonagh says: “We know that we face an issue with the skills gap, both locally and globally.” That’s why Siemens: “Are committed to training the next generation of engineers”. I think this is a brilliant partnership. Siemens’ commitment to education and training through initiatives like the University of Manchester pilot plant deserves high praise and I am delighted to feature them in my blog. If you are working on an industry-academia collaboration why not get in touch and tell us about it.